The civic center is the seat of local government. 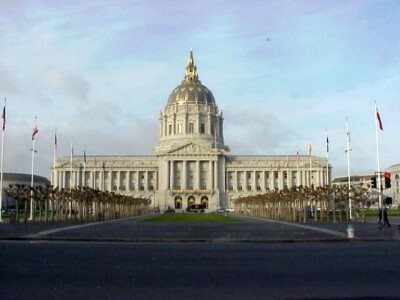 You will find city hall here (worth a look incidentally - it is really quite impressive), in addition to the Opera House, Davies Symphony Hall, the Asian Art museum and Peace Pagoda Gardens. Monday - Friday 10:00 am, 12:00 noon and 2:00 pm. Public tours run 45 minutes to an hour. Reservations are required for groups of eight or more and must be made four weeks in advance to allow for scheduling. A fee is charged for private groups of eight people or more. There is no charge for school groups from the elementary-high school level. The sign-up location for tours is the Docent Tour kiosk, located in the Van Ness Ave. lobby next to the elevators.